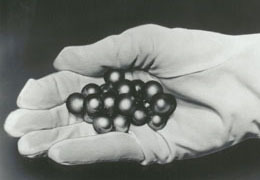 SAPPHIRE OIL IS A USED AS A LUBRICANT WHEN BALL SIZING. FOR HEAVY UPSETS OR WHEN A BETTER FINISH IS REQUIRED THIS HIGHLY CHLORINATED OIL OR WAX IS THE BEST CHOICE. IT IS ABOUT A FORTY WEIGHT OIL THAT IS EASILY APPLIED TO ANY BORE.